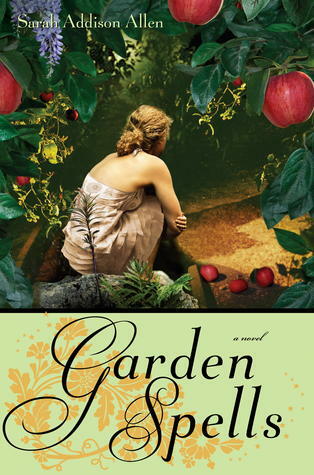 Despite having read numerous reviews of Garden Spells before I picked it up from my library, I still didn’t know what to expect. In fact, there seems to be an unspoken rule when it comes to this novel that each review must be vague and ambiguous, but after reading the novel, I can confirm that there really isn’t much to say about this story. It is simply one that demands to be read, felt, and soaked up. Quite simple put, Garden Spells is about the Waverly Sisters, Claire and Sydney. For the first six years of her life, Claire knew no home, merely traveling with her mother from town to town. When her younger sister, Sydney, was born, though, her mother returned to her small North Carolina hometown. From that moment on, Claire has never wanted to leave, yearning to earn her place as a Waverley and set down some roots. Sydney, though, was the exact opposite. When their mother took off again when Sydney was six, this time it was Sydney who yearned for something different. Now, all grown up, the two sisters are practically strangers to one another. When Sydney returns home after ten years with her five-year-old daughter, Bay, in tow, just escaping an abusive relationship, Claire’s life is turned upside down. Claire demands routine and having her sister return, not to mention the too-hot-to-handle Tyler move in just next door, changes her life. Yet, as these two sisters will find out, home is not just made up of roots; it’s made up of relationships as well. And some of them are there to stay. From the first chapter itself I fell in love with this story. Allen writes beautifully, drawing the reader in with her simple, but compelling prose. Claire and Sydney become more than characters as the pages fly by, they become your own sisters. While their journey to one another, learning to trust and open up, is heartwarming, the true gift of this novel lies in their own paths to self-growth. Claire and Sydney learn to embrace themselves and embrace life, whether it is through finally accepting people in or finally accepting yourself. And while their romances are warm and touching, they are merely stepping stones to a greater understanding these two women find within themselves. I loved Claire’s story for its outward simplicity, but inward trauma. And I loved that Sydney’s story was just the opposite. Although she is running away from an abusive relationship and the effects of that fear hang over her, Sydney learns that the key to happiness is not as complex as it seems. Bottom Line? Don't miss out on this gem. Garden Spells is a vastly under-appreciated adult contemporary that blossoms with love, comfort, and happiness. It tackles serious issues with poise, never becomes an issue novel (though it could have) and best of all, it leaves you with a tingling sensation of joy that you feel all the way down to your toes. I may not have read any of Allen's other novels, but I know I will be picking them all up very soon. I can describe her work in just one word: Perfect. I read this before the bantering around of the term "magical realism".... or at least before it became popular. :) I enjoyed this book so much too. I became a fan of her work just from this book. Great review! Lovely review! I do understand what you mean about sometimes being unable to say much specifics about a book through reviews, because some books really are ones that should just be experienced with few preconceived notions. I do like the sound of a sister relationship, and the whole culture that seems to go with this town. I'll have to look further into this book for sure! I'm so happy you loved this one, Keertana! It's definitely my favorite of Allen's novels that I've read. The two sisters' relationships, their love interests, and the subtle insertion of magic all combined perfectly for me. I've never read this author, but many friends rave about her! Which should I start with? I LOVE sister stories, actually some of the returning home, family elements remind me a bit of NOWHERE BUT HOME, which I just finished and LOVED so much. Anyway, I've definitely added this one to my radar, you've certainly sold me on it. I so want to read these. Darn it, I just never have had a chance. I guess I should rectify that. Thanks for the review.